Namesake - The building was named after Commodore Perry Snell (born 1869) of St. Petersburg, Fl. who was a former student of the Ogden College. "Mr. Snell has been a life-long friend of Western and has made many valuable contributions to the institution, which includes art collections and museum pieces now in the Kentucky Museum. "(Snell Hall, 2-10-39) He was also a very successful real estate developer. History - When the building was first opened, it was used by the Ogden College until 1928 when the college was "consolidated with Western." Located at the east of the building was an Italian Garden which was also made possible by a donation from Mr. Snell. The garden was added in 1929 and was designed by Henry Wright. 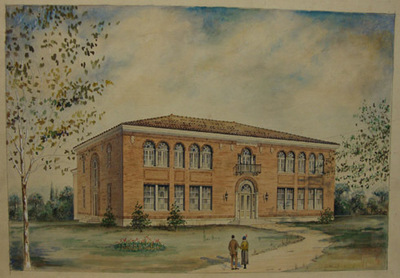 The building was dedicated on Nov. 19, 1924. The building had recitation rooms, lab space and a 500 seat auditorium. The hall was used by the biology and agriculture departments. In 2002, plans to raze the building began because it was would have been too expensive to remodel it. The building was put on the "Endangered Historic Places" list. The building was on the National Register of Historic Places. President Ransdall agreed that if enough money could be raised by The Ogden Foundation for renovations, then the building would be kept. However, the money was not raised and the building was torn down in order to make way for a new science building. At one time, it was the only building of the Italian Renaissance style, here in Bowling Green that was open to the public.